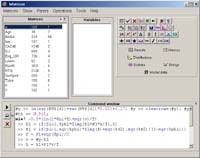 The current version of Matrixer can be used free of charge. What's Matrixer supposed to do? Matrixer is a piece of software especially suited for teaching econometrics and doing medium-scale applied research. It is small (in physical size, not in capabilities) and has smooth interface. Many routine operations could be done in seconds. Vector and matrix operations (that is why it was called Matrixer). Nonlinear regression with instrumental variables (generalized method of moments, GMM), command nliv! Negative binomial regression (NegBin-2), command negbin!